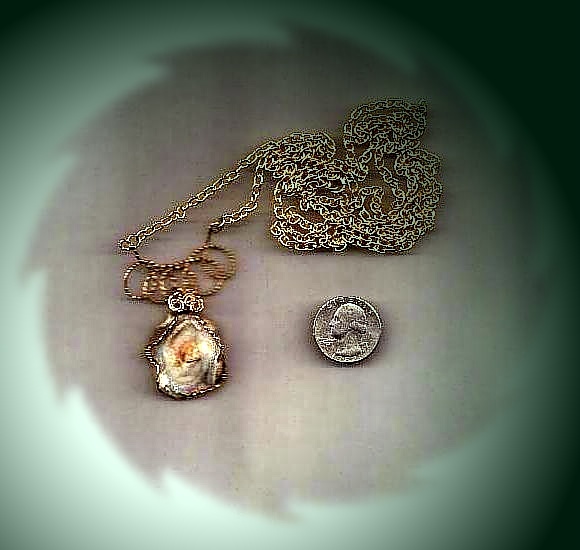 "Earth's Beauty" Pendant: Fossilized shell; cream to lt.brown with brown stripes. This is a free form piece tied with gold-plated wire. "Tiger Eye" Pendant: Gold Tiger Eye; 20x15mm oval, domed, highly polished. Thin blue streaks adorn ths piece. Mounted on gold. "Pink Beauty" Bracelet: Tear-drop shaped, free form, Rose, pink and gray banding (agate), polished. Stone is wrapped and tied with gold-filled wire. Each link of bracelet is hand formed from twisted, gold filled wire. "Unusual" Pendant: Irregular shape(almost round) piece of Quartz formation. Rose-colored center surrounded by shades of gray banding. Hundreds of tiny crystals glitter from this piece. Wrapped and tied with twisted, gold-filled wire. "Marble-Like Pendant" Agate, nimex; 18x13 oval cabashon, highly polished. Mix of milky white, red, gray and brown. Gold plated mounting. "Nice One" Pendant: Gold Tiger Eye; 20x15 oval cabashon, domed, highly polished. Gold- plated mounting. "Celebrity" Pendant: Lake Superior Agate; 25x18 oval cabashon, domed, highly polished. Mostly med. gray, circular banding of white and darker gray.Silver plated mounting. Pendant: Piece of Natural (velvety, cloudlike appearance) quartz. Hundreds of tiny crystals glitter from this stone. It is adorned all-around with nickel silver wire filigree. "Dark Storm" Pendant: Free-form oval (1"wide x1 7/8" long x 3/16" thick) montana agate; translucent with moss-like inclusions. Color graduates from near-black to lighter shades of brown. Filigree front and back. Some gold-plated but mostly nickel silver wire. "Iceberg" Pendant: Piece of multi-faceted quartz crystals (width=6mm and smaller. Minimum of 12 crystals in a cluster).Filigree gold plated wire. 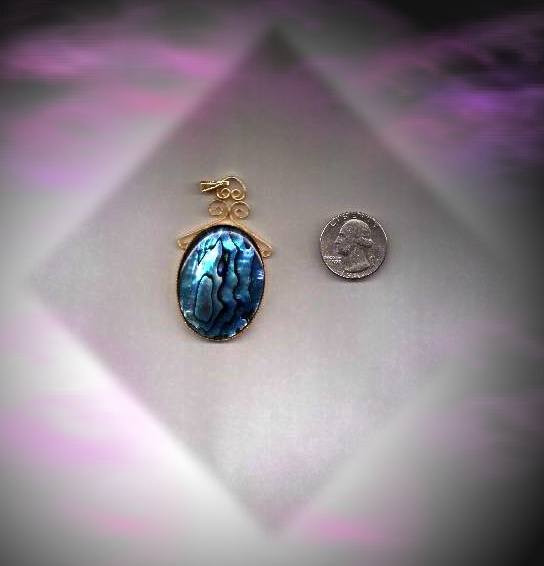 "Tropic Blue" Pendant: Genuine Paula Shell; blue. 40x30mm, oval caboshon. Domed, highly polished. Delicate, gold plated mounting. 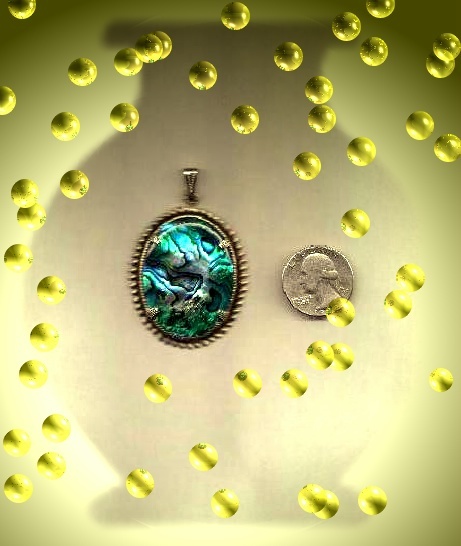 "Tropic Green" Pendant: Genuine Paula Shell; green. 40x30mm, oval caboshon. Doomed, highly polished. Sterling silver look. Plated mounting. 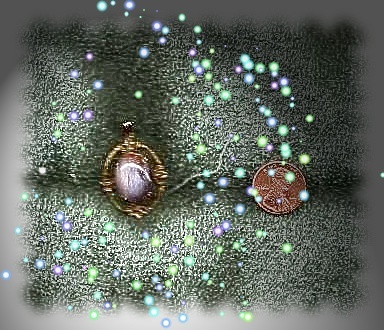 "Ultimate" Pendant: Bloodstone (hunter green with blood-red spots). 25x18mm, oval caboshon. Domed, highly polished. Mounting is of beautiful floral design (gold plated), on black background. 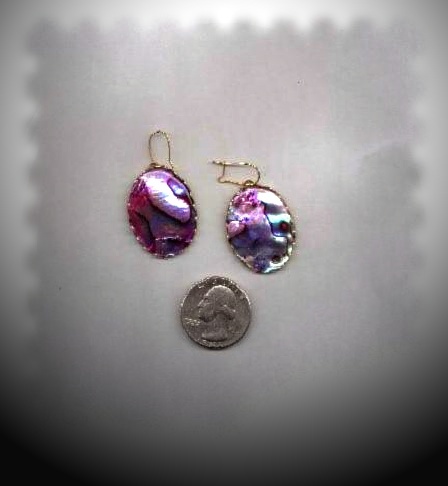 "Islands" Earrings: Genuine Paula Shell (Pink). Oval, 25x18 caboshon. Domed, highly polished. Simplistic gold plated mountings. For Pierced Ears. 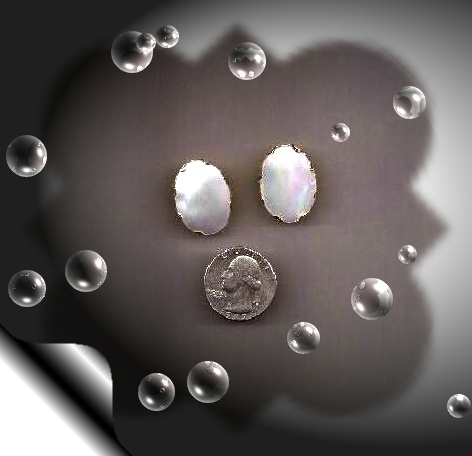 "Intrigue" Earrings: Genuine Mother of Pearl. 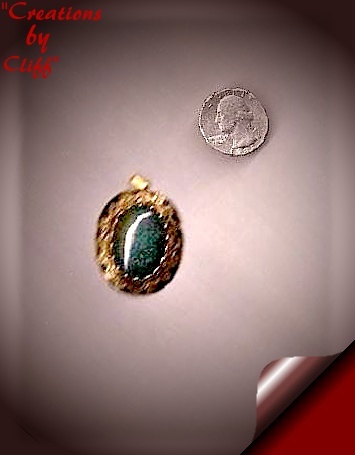 25x18mm, oval caboshon. Domed, polished. Simplistic gold-plated mounting. Type:(clip-on).